Abnormally sustained immune reactions drive B-cell proliferation in some cases of marginal zone lymphoma but the CD4+ T-cell subsets, which are likely to contribute to the B-cell responses in the tumour microenvironment, are not well characterised and neither has the spatial distribution of the different subsets in involved lymph nodes been investigated. 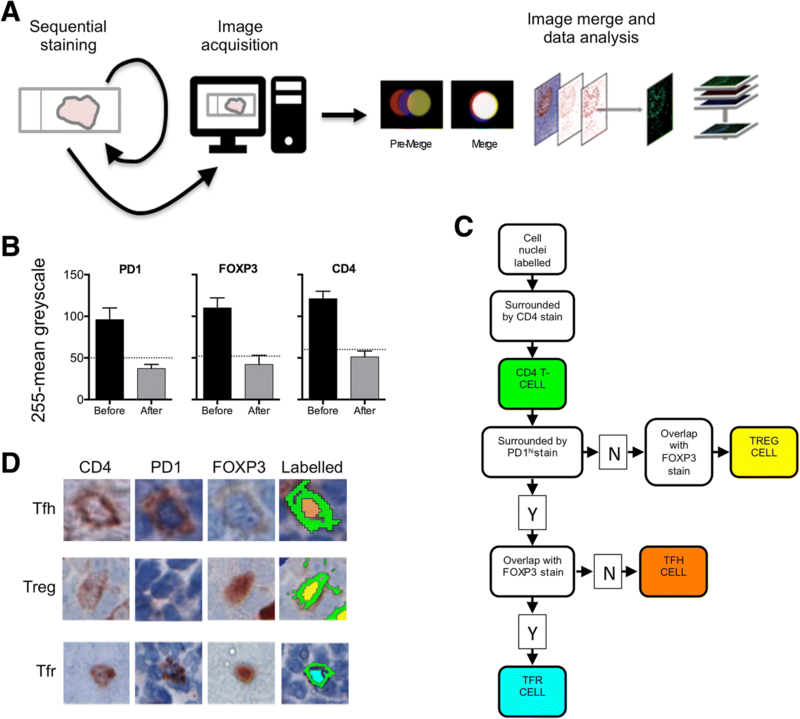 Employing a workflow of multiplex semi-automated immunohistochemistry combined with image processing we investigated association between infiltrating T-cells and proliferating lymphoma B-cells. Both total numbers of activating follicular helper (Tfh) cells (defined by high expression of PD1) and suppressive regulatory (Treg) T-cells (defined by FOXP3+ expression) and the Tfh:Treg ratio, assessed over relatively large areas of tissue, varied among cases of marginal zone lymphoma. We determined spatial distribution and demonstrated that PD1hi cells showed significantly more clustering than did FOXP3+. 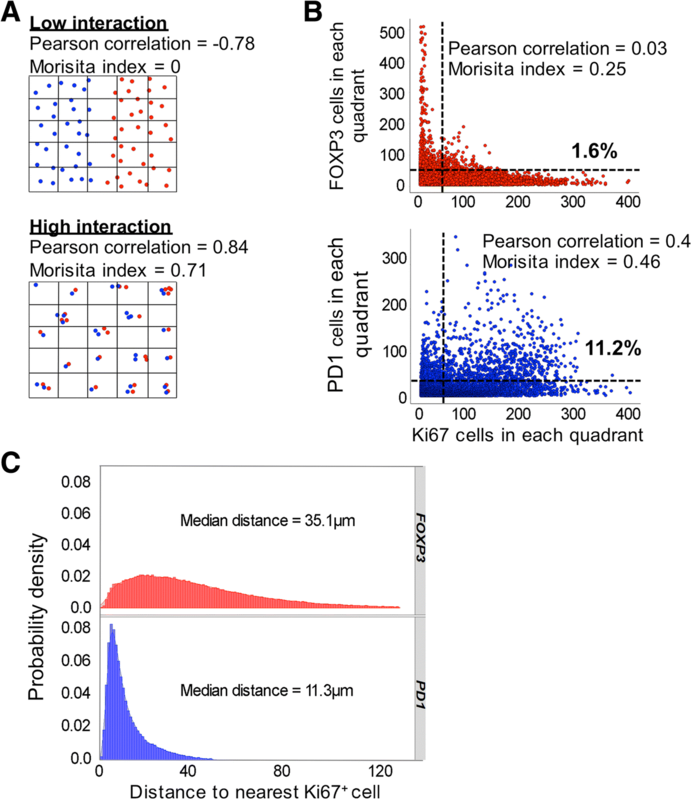 To investigate the association of infiltrating T-cells with lymphoma B-cells we employed Pearson correlation and Morisita-Horn index, statistical measures of interaction. We demonstrated that PD1hi cells were associated with proliferating B-cells and confirmed this by nearest neighbour analysis. The unexpected architectural complexity of T-cell infiltration in marginal zone lymphoma, revealed in this study, further supports a key role for Tfh cells in driving proliferation of lymphoma B-cells. We demonstrate the feasibility of digital analysis of spatial architecture of T-cells within marginal zone lymphoma and future studies will be needed to determine the clinical importance of these observations. Marginal zone lymphoma (MZL) includes three entities: nodal, extranodal (mucosa associated lymphoid tissue (MALT) lymphoma) and splenic marginal zone lymphoma (SMZL) . These conditions share phenotypic and morphological features  but show varying genetic aberrations [2–5]. Extranodal MZL, the commonest of the three subtypes of MZL, has been linked to infectious micro-organisms  or autoimmune disorders prompting the idea that overactive immunity underlies lymphomagenesis  and this is supported by the association between some autoimmune conditions such as Sjögren’s syndrome with MZL. There are recognised to be several different CD4+ T-cell subsets with different functions in normal immunity . One of these subsets, follicular helper (Tfh cells) T-cells, is essential for normal immunity and is also required for the development of autoimmunity . As well as characteristically producing IL-4 and IL-21, Tfh cells demonstrate high surface expression of PD1 (CD279) and nuclear expression of BCL6. Suppressive CD4+ T-cell subsets (regulatory T-cells (Tregs), (PD1lo and FOXP3+), and follicular regulatory T-cells (Tfr) (PD1hi and FOXP3+) counter the activating effects of Tfh cells . Recent progress in computational biology that allows unbiased statistical modelling of the spatial distribution of lymphocytes has been applied to breast cancer in order to understand how the different cell types i.e. cancer cells, lymphocytes and stromal cells, interact with one another. This work has demonstrated that patterns of lymphocyte infiltration are prognostic  and specifically that Tfh cell infiltration and gene signature predicted response in breast cancer . Numbers and pattern of T-cell infiltration have been demonstrated to correlate with some clinical characteristics in follicular lymphoma  and diffuse large B-cell lymphoma  and biologically this might be associated with their effects on B-cell proliferation: either activation (Tfh cells) or inhibition (Tregs). There are also recognised to be specific patterns of Treg infiltration in follicular lymphoma  but more detailed and quantitative investigation has been hampered because manual methods do not allow large areas of tissue to be analysed. There has been much less work on T-cells in MZL. Tregs, are present in the tumor microenvironment (TME) in extranodal MZL  but activating follicular helper T-cells (Tfh) have not been characterised although they are a highly relevant subset because they are the principal producers of IL-21 and IL-4, which are growth factors important for normal and malignant B-cells . MZL, unlike follicular lymphoma, usually has no discernible histological structure, which adds to the difficulty of detecting the spatial characteristics of infiltrating T-cells. In this report we combine immunohistochemistry and computational methods to show unexpected differences in the distribution of PD1hi and FOXP3+ cells in MZL. Fifteen MZL biopsy samples (spleen = 3, lymph node = 7, periorbital = 2, parotid, lung, thyroid = 1 each) were obtained from Leicester Royal Infirmary under Research Ethics Committee 14/EM/1176. (female = 11, male = 4; median age 63.5 years (range 48–74 years)). The characteristics of the patients and the treatment they received are shown (Table 1). Immunofluorescence (IF) staining was performed using Opal 4-color fluorescent IHC kit (NEL800001KT, Perkin-Elmer, Waltham, MA, USA). Following antigen retrieval formalin fixed and paraffin embedded (FFPE) sections were incubated with protein block (RE7102, Novolink™ Polymer Detection System, Leica Biosystems, Wetzlar, Germany) for 10 min. For multiplex staining antibodies were used sequentially, first, anti-CD20 (1:100) (M0755, DAKO, Glostrup, Denmark), second anti-PD1 (used undiluted) (ab52587, Abcam, Cambridge, UK) and lastly anti-Ki67 (1:100) (M7240, DAKO) antibodies were incubated with tissue sections for 30 min at room temperature. Following incubation with HRP conjugated goat anti-mouse-IgG (1:200) (P0447, DAKO) for 1 h at room temperature slides were washed and incubated for 10 min at room temperature in the dark with Opal 520 (dilution 1:50) for anti-CD20, Opal 670 (1:100) for PD1 and Opal 570 (dilution 1:50) for Ki67. After additional washes nuclei were counterstained with DAPI (D1306, ThermoFisher). A negative control slide, incubated with mouse IgG1 (X0931, DAKO) was included in each staining run. Images of the stained slides were recorded using NanoZoomer-XR Digital slide scanner C12000–01 (Hamamatsu Photonics, Hamamatsu, Japan) and the images were pseudo-coloured and merged by using ImageJ analysis software . In order to identify specific T-cell subsets by multiplex immunohistochemistry (workflow illustrated in Fig. 1a) FFPE tissue sections were stained with anti-CD4 (4B12, DAKO) (1:80 dilution for 20 min), anti-PD1 (EuroMabNet, clone NAT105) (used undiluted for 60 min) and anti-FOXP3 (EuroMabNet, clone 236A) (1:100 dilution for 60 min) [17, 18]. For all antibodies antigen retrieval was with Tris-EDTA pH 9. Peroxidase-coupled secondary antibody (MP-7452, Vector Laboratories, Burlingame, CA, USA) was employed with AEC-peroxidase substrate (SK-4205, Vector Laboratories). Tissue sections were processed through sequential staining and destaining (glycine (25 mM), 1% SDS, pH 2) following which image data was acquired and downstream processing carried out. This involved registration of the separately stained images followed by data analysis, which includes both enumeration of stained cells and also spatial information i.e. co-ordinates of each cell (Visiopharm, Hoersholm, Denmark). All images that were taken forward for data analysis were carefully checked for successful registration. Persisting antibody from early rounds of staining could be a confounding factor and we, therefore, confirmed that the elution process reduced residual staining to background levels (Fig. 1b). Visiopharm apps were developed (available on application to the authors) to paint Tfh cells (CD4+PD1hiFOXP3−) orange, Treg cells (CD4+PD1−FOXP3+) yellow and Tfr cells (CD4+PD1hiFOXP3+) turquoise (Fig. 1c and d) prior to extracting cell numbers and location coordinates. An intensity threshold for the definition of high PD1 expression was set by utilising PD1 expression of Tfh cells within tonsillar germinal centres from healthy subjects. Tissue sections from 6 cases (Fig. 2b) were stained with anti-CD20 (M0755, DAKO), anti-CD4 (M7310, DAKO), and anti-CD8 (M7103, DAKO). Surface plots generated in ImageJ (https://imagej.net/Fiji) are shown for each stain. Intensity has been normalised so that images can be compared. Distance from either FOXP3+ cells or PD1hi cells to the nearest Ki-67 cell was plotted for 105 cells sampled from 10 cases. All clustering and spatial analysis was performed using the statistical programme R (Spatstat package  and ggplot2 package ). R was also used to determine Ripleys K function, an analysis tool to quantify the spatial distribution observed for each cell subtype as compared to complete spatial randomness (CSR). Other statistical tests (Mann-Whitney, Kruskal Wallis tests and linear regression) were carried out with Prism 6 software (GraphPad Software, La Jolla, CA). Gene set enrichment analysis  (http://software.broadinstitute.org/gsea/index.jsp) was employed to analyse gene expression data from a publicly available database  under accession numbers GSE32233 and GSE32231. To gain an understanding of T-cell distribution in MZL multiplex semi-automated immunohistochemistry was carried out for CD20, CD4 and CD8. Whole tissue heat-maps show the density of infiltrating T-cells (Fig. 2a). These reveal T-cell zones comprising low numbers of CD8+ and abundant CD4+ T-cells with clearly differing patterns of spatial localisation. To provide support for the presence of activated T-cells in the MZL TME we carried out gene set enrichment analysis on data from nodal MZL . Two signatures (GSE2770 - genes up-regulated in CD4+ lymphocytes induced to differentiate into Th1 and Th2 by treatment with IL-12 and IL-4 respectively in the presence of TGFbeta and GSE26928 - genes up-regulated in effector memory T-cells as compared to CXCR5+ T-cells) of polarised CD4+ T-cells (Fig. 2b) were obtained (FDR < 0.25). 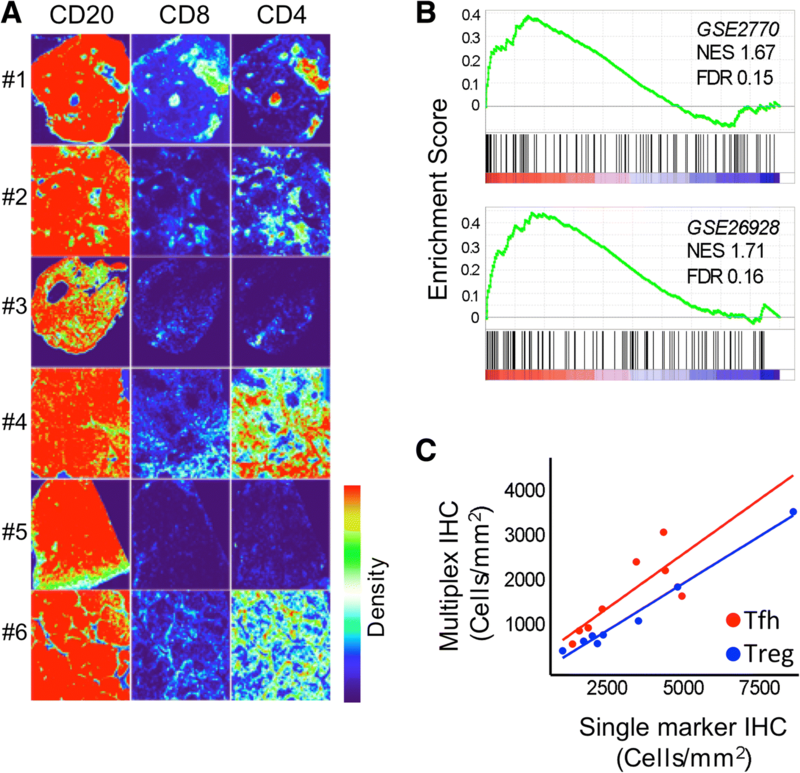 The tissue density maps and GSEA together suggest effector CD4+ T-cells are present in the tumour microenvironment. Next we used image analysis to overcome biased representation due to counting relatively small fields and acquired similar quantitative information about infiltrating CD4+ T-cell subsets (Tfh, Tfr and Treg). We defined Tfh cells as CD4+PD1hiFOXP3−, Tfr cells as CD4+PD1hiFOXP3+, and Treg cells as CD4+PD1−FOXP3+ (Fig. 1c and d). Collectively these three populations accounted for 16.4 ± 3.6% mean ± SEM) of total CD4+ cells (n = 8). Tfr cells represented only a rare population accounting for 4.6 ± 1.3% (mean ± SEM) of CD4+PD1hi and were not anlaysed further. We found strong associations between PD1hi and Tfh cell numbers (R2 = 0.98; P < 0.0001) and FOXP3+ and Treg numbers (R2 = 0.64; P = 0.017). Therefore, to facilitate this analysis and future translational lymphoma research we followed others in employing single markers, either PD1hi or FOXP3+ [12, 23] as surrogates for Tfh and Treg subsets respectively (Fig. 2c). Total numbers of PD1hi and FOXP3+ numbers varied over ~ 20-fold with some cases having very much heavier T-cell infiltration than others (Fig. 3a). The ratio (PD1hi:FOXP3+) also varied with activating PD1hi cells the majority in some cases whereas suppressive FOXP3+ cells were dominant in others. Analysing SMZL, nodal and extranodal MZL separately showed no significant differences between overall density of PD1hi or FOXP3+ cells or PD1hi:FOXP3+ in the three groups (Kruskal Wallis test) (Fig. 3b). There were also no significant differences in T-cell density or PD1hi:FOXP3+ when the cases were analysed by stage (Fig. 3c). Next, we chose to explore the spatial distribution of infiltrating PD1hi and FOXP3+ cells, having observed various patterns of CD4+ T-cell infiltration (Fig. 2a), in order to determine whether these cells are randomly distributed or clustered. Ripley’s K test, was applied to data from whole tissue sections (mean area 50.7mm2, range 4.8–112 mm2) (n = 15) (Fig. 4a). Overall we found that PD1hi cells were significantly more clustered i.e. greater separation of observed curve (solid black lines in Fig. 3a) from CSR (dotted red lines), than FOXP3+ cells (median cluster score 1.84 for PD1hi cells and 0.45 for FOXP3+ cells; Mann-Whitney test P = 0.003) (Fig. 4b). Tfh cells strongly drive B-cell proliferation and even extra-nodal CD4+PD1hi T-cells are able to secrete factors enabling B-cell help . 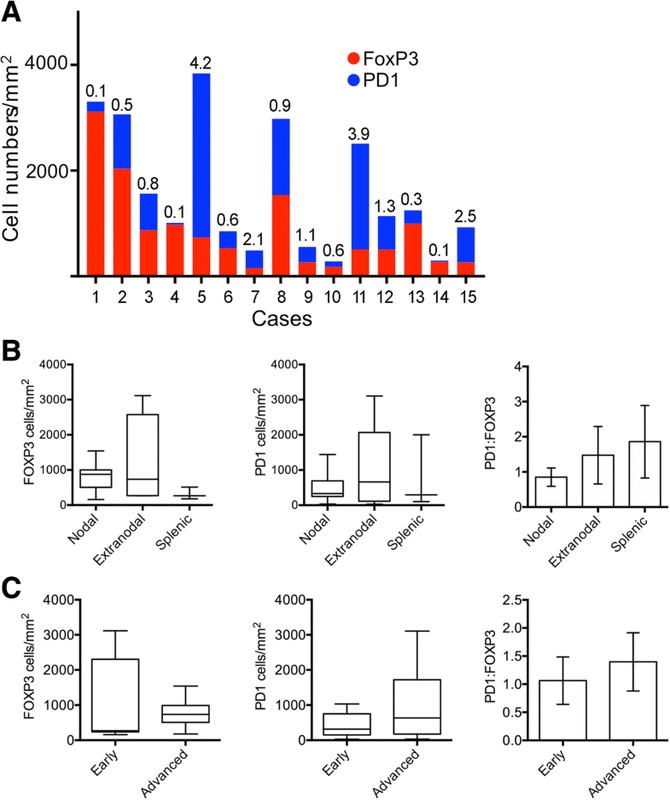 We hypothesised that the PD1hi cells might associate with proliferating lymphoma B-cells. To support this idea we first carried out immunofluorescence microscopy on a single case (Fig. 4c). This showed that proliferating Ki-67+ cells were predominantly B-cells and formed clusters but without the structure of normal or residual germinal centres. There was also an apparent association between areas with a high density of proliferating cells and PD1hi cells. In order to support the hypothesis that PD1hi cells associate with Ki-67+ lymphoma B-cells we quantified the spatial interaction between Ki67+ cells and Ki67−PD1hi T-cells. Cell co-localization was objectively determined by virtually tessellating stained tissue sections into non-overlapping equally sized quadrants prior to cell counting within each defined spatial area . Two measures, Pearson correlation and Morisita-Horn index, an ecological measure of interaction (illustrative examples Fig. 5a), were employed to analyse data from 17,000 200μm2 quadrants from 10 patients. Ki67+ and PD1hi cells demonstrated closer interaction than did Ki67+ and FOXP3+ cells (Pearson correlation 0.4 vs 0.03; Morisita-Horn index 0.46 vs 0.25, Fig. 5b). To further interrogate spatial interaction we compared the distance between PD1hi or FOXP3+ cells and the nearest Ki67+ cell in a nearest neighbour analysis. 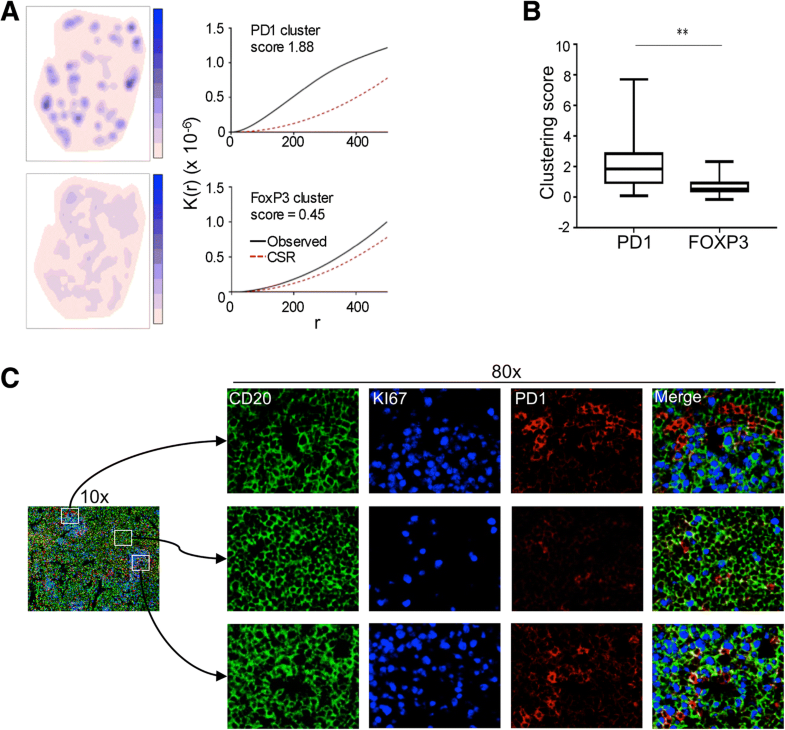 Ki67−PD1hi cells (median distance 11.3 μm) were significantly more likely to be found in close proximity to Ki67+ B-cells than were Ki67−FOXP3+ cells (median distance 35.1 μm) (Mann-Whitney test P = < 0.0001) (Fig. 5c) suggesting for the first time that infiltrating Tfh cells might have a role in driving proliferation, and hence contribute to the varying clinical course of MZL. In this report we demonstrate unexpected architectural complexity within MZL, defined by the analysis of single surface markers, PD1, representing Tfh cells and FOXP3, representing Tregs. Infiltrating CD4+ T-cell subsets have been studied by others in follicular lymphoma and the distribution of cells in relation to the follicle associates with clinical characteristics . MZL shows histological heterogeneity: while some cases show a diffuse pattern of infiltration in others a follicular pattern is observed. Residual germinal centres, which are presumed to be normal reactive follicles, are also a feature of MZL. Residual germinal centres show the characteristic features of a polarised structure with BCL6 expressing proliferating B-cells in the dark zone and Tfh cells within the light zone. A limitation of our study is that we cannot entirely resolve the issue of whether the Tfh clusters we observe represent residual germinal centres. Inspection of the PD1 stained slides suggested that, in our series there were relatively few residual germinal centres and, therefore, our data supports the notion that Tfh clusters are a feature of the lymphoma but does not definitively exclude the possibility that some clusters are due to residual germinal centres. This study also prompts further questions about possible extra layers of complexity in the structure of MZL, which lie outside the scope of this work. For example, could Tfh clusters be associated with residual germinal centres? In order to determine whether patterns of cell distribution are non-random analysis has to be carried out across whole tissue sections using an unbiased biostatistical approach. The number of patient cases in this study is low and we cannot, therefore, make definitive statements about the spatial characteristics of infiltrating T-cells in a disease as diverse as MZL. However, using automated techniques we determined spatial characteristics over large areas and taking into account data from 106 cells (Fig. 5c) this allows robust and statistically significant conclusions to be drawn and, in turn, this allows us to generate hypotheses about the role of infiltrating T-cells in MZL. CD4+ T-cell subsets are characterised by multiple surface markers, cytokine production and transcription factors. Supported by the work of others  who demonstrated that PD1 was highly expressed only on Tfh cells in follicular lymphoma we have used PD1hi as a single marker to define Tfh cells. Both Treg and Tfr populations express FOXP3. We are interested in translating our work into the clinical laboratory and, therefore, we chose to employ immunohistochemistry for the bulk of the work described here although our observation of possible interaction between PD1hi cells and B-cells was made by immunofluorescence microscopy. We showed good correlation between single marker and multiplex immunohistochemistry (Fig. 2c) and chose to employ single markers because the simplicity of this methodology will facilitate future studies involving larger numbers of patients. We show the feasibility of mapping the spatial architecture of T-cell infiltration in MZL but the clinical impact of our findings in MZL, and possibly other low-grade B-cell lymphoma subtypes, needs testing prospectively. Importantly, we suggest the hypothesis that Tfh cells have a role in driving B-cell proliferation in MZL. This idea is compatible with the biological role of normal Tfh cells, which are required for driving B-cell proliferation  and antibody production  and also supports evidence for Tfh involvement in follicular lymphoma [29, 30]. Our data suggests that CD4+ T-cell subsets other than Tfh cells are present in the tumour microenvironment of MZL warranting further studies characterising these and establishing their biological and clinical significance. The mechanisms determining tumour ecology in MZL are unclear but a testable hypothesis is that the specific mutational spectrum of the B-cell lymphoma influences the character of T-cell infiltration in the TME. Overall combining spatial characterisation and genomic features, such as IgVH repertoire and KLF2 mutational status , might identify MZL patients with poor outcomes and help to define effective treatments. Katherine Wickenden, Nadia Nawaz, Simon D. Wagner and Matthew J. Ahearne contributed equally to this work. NN and ALW were supported by the Leicester Haematology Research Fund and the Hope Fund for Cancer Research. SM was supported by a PhD studentship from the Government of Iraq. All data generated or analysed during this study are included in this published article. The Visiopharm app is available on request to the authors. KW designed and carried out experiments. NN, SM, ALW carried out experiments. DK designed essential software. MJA analysed the data and wrote the manuscript. SDW wrote the manuscript. All authors read and approved the final manuscript. Research involving human material was performed in accordance with the Declaration of Helsinki. Tissue samples were obtained from Leicester Royal Infirmary. Tonsil material was obtained after informed consent was taken (Research Ethics Committee (REC) number 09/H0406/42). No consent was necessary for using material from lymphoma patients. The study used surplus archival tissue from lymphoma patients in line with the exemption from consent outlined in The Human Tissue Authority code of practice (Para 41 HTA code of practice section 9), which allows for research upon tissue to be conducted without consent if part of a research project approved by a recognised REC (Health Research Authority (HRA) National Research Ethics Service (NRES) Committee East Midlands REC number 14/EM/1176).